In type 1 CGN, antibodies against glomerular basal membrane (GBM) are formed. Type 2 CGN results in immune complexes, and type 3 is identified by the detection of antibodies against cytoplasmic antigens of neutrophil granulocytes (ANCA). Detection of autoanitbodies against the glomerular basal membrane with an indirect immunoflurescence test on monkey kidney. Antibodies against GBM and ANCA can also occur together. A variety of studies have thus been carried out to show a relationship between these antibodies and a connection in their formation. Affected patients were also evaluated to identify differences or similarities in their clinical outcomes. Of particular interest was the question of whether antibodies against myeloperoxidase (MPO, pANCA) favour the formation of antibodies against GBM. In a 2005 study by Rutgers et al., data was evaluated from patients who were entered into a database following diagnosis with CGN as a result of kidney biopsies carried out between 1978 and 2003 (1). Patients with immune complex deposits (type 2 CGN) were excluded at the outset. There were 127 biopsies with a positive CGN result. In cases where they had not previously been detected, antibodies against GBM and ANCA were confirmed afterward for the study using frozen serum samples taken at the time of biopsy. Only samples positive for MPO and/or GBM antibodies were included, because only one patient gave positive results for both anti-PR3 and GBM antibodies (see Table). In the study, three groups of patients that had tested positive for either one or the other of the antibodies (MPO or GBM) or both were compared to each other. Patients from the groups positive for GBM antibodies or both MPO and GBM antibodies generally had a higher level of disease activity. In contrast, the occurrence of chronic symptoms in these two groups was lower than in those patients that only had MPO antibodies. At the time of diagnosis, only 28 % of the MPO positive patients required dialysis, in contrast to 60 % of the GBM+MPO positive and 69 % of the GBM positive patients. The patients were followed over an average period of 5.1 years (ranging from 2 days to 22 years). CGN patients who were only positive for GBM had the best chance of surviving the first year (100 %). The survival rate for patients with both antibodies (MPO+GBM) was only 79 % and that of patients with MPO as the only antibody shrank to 75 %. In addition to medicinal treatment, patients with MPO-ANCA positive CGN and kidney failure or anti-GBM positive CGN underwent plasma exchange. An isolated description of a case of improvement when both GBM and MPO antibodies were present could not be confirmed by this study. Do ANCA favour the occurrence of GBM antibodies? Strikingly, 43 % of the CGN patients positive for GBM antibodies also had MPO-ANCA. One possible explanation for this could be the pathophysiological connections between the formation of MPO and GBM antibodies. Autoantibodies against myeloperoxidase activate neutrophil granulocytes, initiating degranulation of these cells. This releases reactive enzymes that effect increased proteolysis of the glomerular basement membrane. In addition, MPO activates matrix metalloproteinases, which can cleave Goodpasture antigen, releasing the Goodpasture epitope that is normally embedded in the basement membrane. This makes these normally hidden structures accessible to the immune system, allowing for the formation of GBM antibodies, which lead to the development of Goodpasture syndrome (1). GBM antibodies bind to type IV collagen, which is found in the kidneys and lungs, among other places. Additional triggers include genetic factors, smoking, and reduced immunotolerance (3). J. Serratrice and his team described the case of a patient with ANCA-associated vasculitis. All criteria for microscopic polyangiitis (MPA) were met. However, within three years, the patient developed the clinical symptoms associated with Goodpasture syndrome and antibodies against GBM became detectable. Earlier serum samples from the patient were tested for GBM antibodies; however, these samples were negative. The GBM antibodies only appeared at the time when the kidneys failed (2). Cross-reactivity of ANCA with the GBM test was ruled out. This research group also postulated that a possible explanation is that the pANCA could cause damage to the basement membrane, an effect that has previously been observed in animal trials. Antigens normally hidden within the basement membrane are exposed, allowing the immune system to form autoantibodies against these structures. The same conclusion was reached by the research group of S. Clyne, who made similar observations (3). Because 5 % of all ANCA positive patients also have antibodies against GBM, it is often recommended that a GBM test should be carried out after a positive ANCA result. The detection of GBM antibodies (IgG) in serum can be carried out by ELISA or immunoblot, as well as indirect immunofluorescence (IIF) on primate kidney. In practice, parallel use of IIF and ELISA or blot test has proven effective for diagnosis and monitoring. 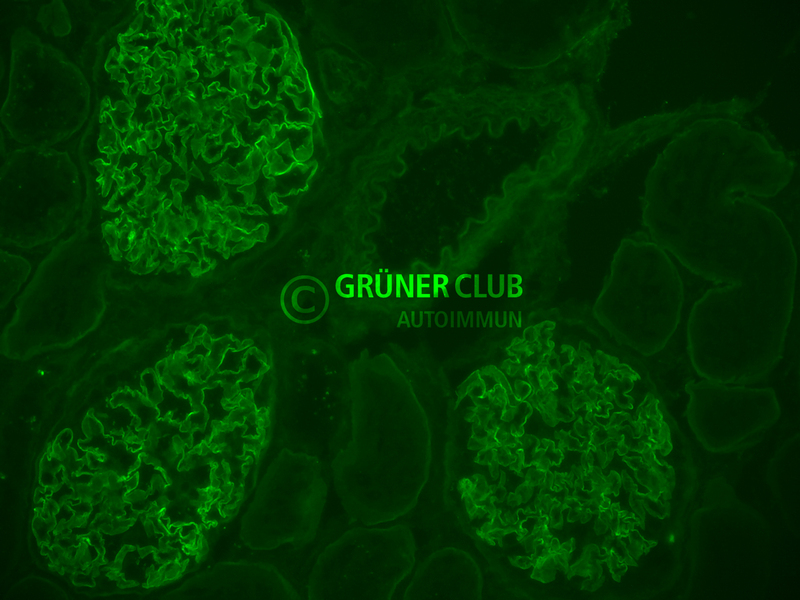 When detecting GBM antibodies by indirect immunofluorescence, the tissue section of primate kidney used as substrate must be treated beforehand (e.g. with glycine) in order to “break up” the glomeruli. This allows the antibodies to bind to the corresponding structures.